If you like to ballroom dance, or would like to learn how, then any album by Wayne King should be in your collection. It seems that his albums were made for just that. I remember dancing to many songs by Wayne King when I was learning how to ballroom dance. Plus, every Friday we would have a dance for all the students, and the Wayne King songs were very popular. Not only are the songs familiar and pleasant, but the rhythm is very easy to dance to for beginners. This particular album has mostly fox trots, several waltzes, and a beguine (don't know what that is - didn't learn that one). So put on your dancing shoes and dance to the music of Wayne King! Here's another album from my Hawaiian category and celebrity category. It's in my celebrity category because Jon Hall was an actor - he starred in "The Hurricane" with Dorothy Lamour, and in the TV series, "Ramar of the Jungle". And it's obvious why it's in my Hawaiian category. Well, Jon Hall does not sing on this album. According to the liner notes, he went into a Hawaiian village pub, set up his own recording equipment, and recorded "a genuine Hawaiian Mardi Gras". So, it's a "live" album, but there's no credit given to the musicians anywhere on the record. It's also not like the other Hawaiian albums I have - it doesn't have the usual, typical songs on it. This one still has to grow on me - the jury is still out on this one. Oh, and I couldn't find a release date on this album. Here's another of my Jackie Gleason albums. As always, it's very pleasing mood music and the songs are all familiar. 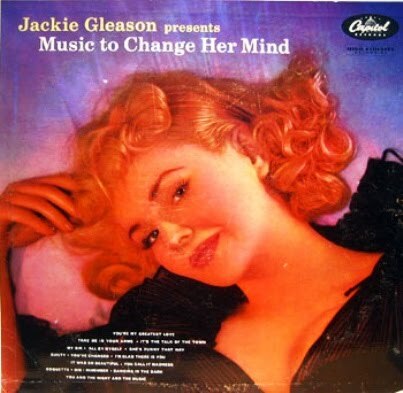 Add Bobby Hackett on trumpet and you can't miss. Enjoy! It's cold here in Dallas and I just don't do well in cold weather (my hats off to those of you who live in really cold climates!). So, in order to make it a little more tolerable, I chose this lovely album of Hawaiian music. Ah, if only to be relaxing on a white sandy beach in Hawaii, listening to the roar of the waves, watching the surfers and sipping on a cold drink while someone plays the ukelele nearby... sigh. See? I feel warmer already! Well, I found this little gem sometime late last year at the little resale shop down the street. Anytime I see a cover that says "Hawaii", I have to buy the record. I don't care if it's someone I never heard of, or if it's the same songs over and over again. I just have to have it! So, this cover definitely called to me, especially the cut-out and the pages inside. Unfortunately, the inside pages had some water damage and were stuck together, and when I went to pull them apart, they tore, even though I was doing it ever so slowly and carefully. :-( But, the record itself was in excellent condition and thoroughly enjoyable! Oh, and it was recorded in Hawaii! Here's a record from my celebrity genre, which I found in the HPB bargain bin for only 50 cents. 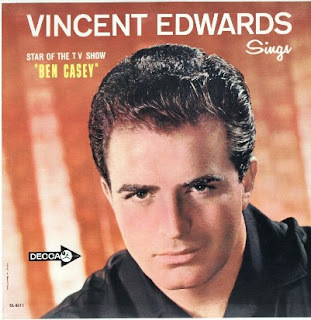 Vince Edwards recorded this during the height of his "Ben Casey" fame. I never saw the show, and I really don't remember Vince Edwards, although I'm sure I've seen him in some old movies or as a guest star on a TV show. Based on his dark rugged looks, I expected his voice to be deep, low, and maybe gruff; I did not expect to hear a tenor. And I think I read someplace that he was discovered by Bing Crosby. All in all, a pleasant record full of the familiar standards. Hmmm... I just realized that I've posted records by several TV doctors - Richard Chamberlain (Young Dr. Kildare), Chad Everett (Medical Center), and now Vince Edwards. I have to say that my favorite is Chad Everett (since he's the only one of the three I remember), but my favorite TV doctor of all time was... Marcus Welby! Too bad Robert Young didn't record an album. Here's one of my favorite choral groups - the Ray Charles Singers. Lately I just haven't been able to get enough of the different choral groups - there just isn't enough time in the day to listen to all the records I want to hear! Besides the fact that this record is by the Ray Charles Singers, I bought it for the cover art, and because it's by Command Records. I don't have too many of the Command Records, but I find that I'm starting to look out for these more and more. One thing I did find puzzling about this particular record is that both the cover and the label say "Stereo", but when I recorded it I didn't see that there were two different tracks. And in some of the songs, the men's voices sound kind of "distant". I'm wondering if maybe the record could have been mislabeled. Odd. Anyway, I still enjoyed this album, especially "Quiet Nights", which is one of my all-time favorite songs. And any album that has "Dominique" on it is fine by me! 1/25/2011 UPDATE: I found the problem with one of my sound settings (don't know how I changed it) and rerecorded this album. It is now in stereo, the way it's supposed to be. "Fiddler On the Roof" is one of my favorite musicals. I have the movie (on VHS - need to burn it to DVD) and the movie soundtrack (will post at a later date). There are so many songs that I absolutely love - it's hard to pick just one favorite. I have never seen it on the stage, but hope to some day. 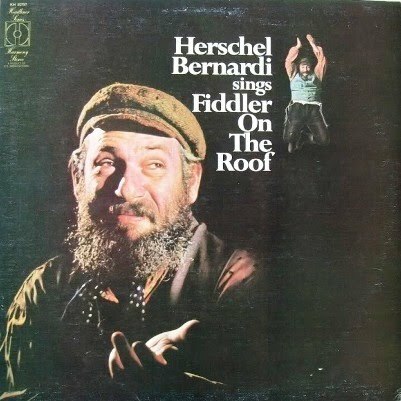 When I found this record (at my favorite little resale shop down the street), I almost passed it over until I saw that it was Herschel Bernardi. I remember his TV show, "Arnie", and that he was the voice of Charlie the Tuna, but I did not know that he had played Tevye in the stage production. Since I love "celebrity" records, I had to buy this - and at 50 cents, how could I go wrong? Well, the record sounded great and I loved the songs. He introduces each song with a little monologue as "Tevye". Which is your favorite song? Happy New Year, everyone! Here's wishing you a happy, prosperous, and healthy 2011! One of my New Year resolutions is to get back to posting on a regular basis - twice a week (except when I'm on vacation). I had to work a lot of overtime (paid, thankfully) last year, so I was unable to post as much as I would have liked to, but my new job is great and seems like there will be overtime just once in awhile. So, I'm hoping to have more time to dedicate to digitizing my record collection, scanning tons of old negatives, and tending to all my other interests. So, to start off 2011, I offer you this little gem that I bought last month at my favorite little resale shop down the street (I also bought two Christmas albums, which I'll share during the next Christmas season). It was the cover art that first grabbed my attention to this album (it'll be framed and hanging in my entryway in the next few days), but I also enjoy listening to Steve Allen. 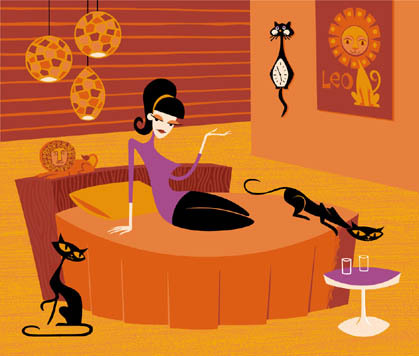 I've already posted my two other Steve Allen albums, and I find them very enjoyable and relaxing. Steve takes us on a trip around the world to places such as Mexico, Spain, France, Japan, Germany, and others. So, if you're already planning your vacation for 2011 (I am), give a listen to this album for some ideas as to where you'd like to go.